Threshold Records was a record label created by the Moody Blues after their 1969 album On the Threshold of a Dream. It was a UK subsidiary of Decca Records and a US subsidiary of London Records. The band formed this label to allow for artistically packaged gatefold covers for their LP releases, and for releasing band members' solo efforts. The first band to be signed up on this label were Westcountry rockers Asgard in 1972 who released two singles from their album, In the Realm of Asgard. Genesis, encouraged by Mike Pinder, also considered signing with the label in 1970. According to Tony Banks, they recorded a version of "Looking For Someone", a song which later appeared on their sophomore album Trespass but shelved it due to a mistake in performance toward the end with no time to redo it; he insists "I can't put out something that has a brown note on it and that's one of the reasons we didn't go with Threshold in the end." Bassist John Lodge produced the band Trapeze for the Threshold label. The rock sextet Providence also recorded for Threshold. After 1976 the Moody Blues went back to having their albums manufactured by Decca Records (and later PolyGram and Universal Records), but the Threshold company and logo were maintained over the years as a means of selling their records through their own record shop in Cobham, Surrey. 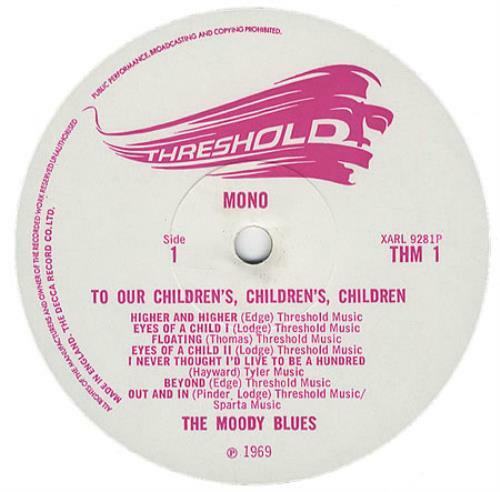 The Moody Blues' subsequent albums, up to and including 1999's Strange Times, were branded 'in association with Threshold Records'.